You will be in this price category if you hire a professional with insurance and permits. Even though it may be basic level, it doesn't have to be boring. You will need to stay within the footprint of your existing kitchen and keep cooking and plumbing fixtures where they remain. However, by choosing a unique cabinet door style, granite countertops, and coordinating floor and backsplash type material, you will create a custom kitchen even though it is a standard configuration. Everything will be gutted in this level of renovation and non-load bearing walls can be moved to increase the kitchen size. Custom islands can be installed and appliance locations can be changed. 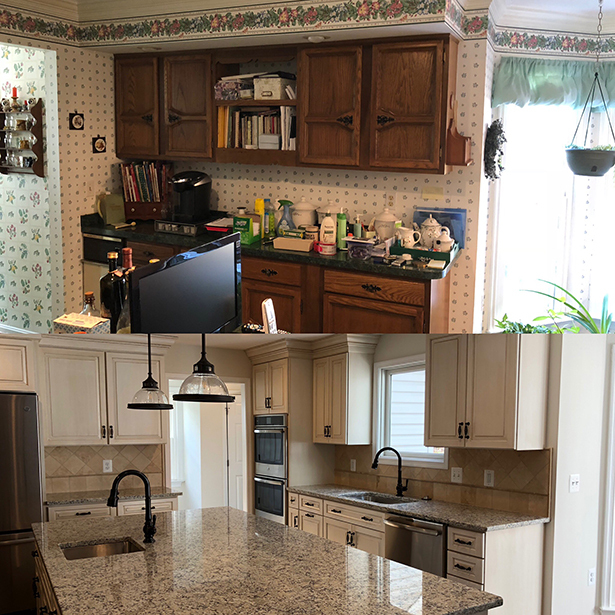 Most people usually elect to upgrade the cabinets to self closing door and drawers and install stained grade crown molding in their entire kitchen to match the crown molding on the cabinets. A true one of a kind kitchen that is a chef's dream. Exotic granite backsplashes and countertops with custom edge profiles, top of the line appliances and cabinetry. You name it, and this kitchen has it and more. These projects don't come along often, which makes them unique and one of our favorite projects to undertake. For an interesting read on ROI for common remodeling projects, broken down by region, please click here.